Could you be gluten intolerant? Take this home coeliac test to be sure! GlutenCHECK is a simple to use home test kit that detects celiac disease (gluten intolerance) with quick, easy to read results. It takes only five minutes to find out if you are gluten intolerant and put your mind and body at ease! Just a simple pin prick of your blood is required and results are quick and easy. We don't recommend trying a gluten-free diet as a first option if you are experiencing symptoms related to eating gluten. We recommend continuing to eat gluten so the test is accurate and full reflection of your health. Celiac disease is a lifelong, serious gastrointestinal disorder which can cause a wide spectrum of clinical symptoms such as diarrhoea, abdominal distension, malnutrition, weight loss or skin disorders. The illness is caused by a permanent intolerance to gluten, a complex mixture of proteins found in wheat, rye, barley and spelt. 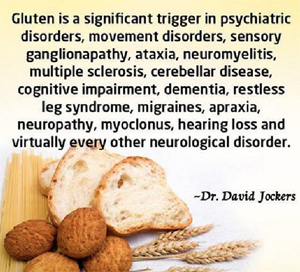 The symptoms of disease can only be avoided by following a gluten free diet. Gluten intolerance, also known as celiac disease (or Coeliac disease) can affect all types of people and is a reaction caused by gliadin – a gluten protein found in wheat. Because of the broad range of symptoms celiac disease presents it can be difficult to diagnose. The symptoms can range from mild weakness and bone pain to chronic diarrhoea, abdominal bloating, and progressive weight loss. How Does GlutenCHECK home health test work? GlutenCHECK is a rapid diagnostic home test which detects the lgA anti-bodies in a blood sample taken from the fingertip. 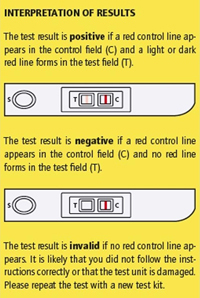 If the sample contains these antibodies the testing card will indicate a red coloured line in the testing and control field. An integrated control system ensures the correct use of the test. The test requires only one drop of blood from the fingertip and provides reliable information as to whether or not you are suffering from celiac disease and need to switch to a gluten-free diet.. If you think you may suffer celiac disease, find out once and for all, with GlutenCHECK! If you are experiencing symptoms when eating foods that contain wheat, barley, rye or oats and think you have a sensitivity to gluten, it’s important to first rule out coeliac disease. If you have confirmed test results that indicate that you do not have coeliac disease and other causes of your symptoms have been ruled out, you might wish to discuss the possibility of non coeliac gluten sensitivity with your healthcare team. Then you can modify your diet to make real changes and manage yourself back to full health.